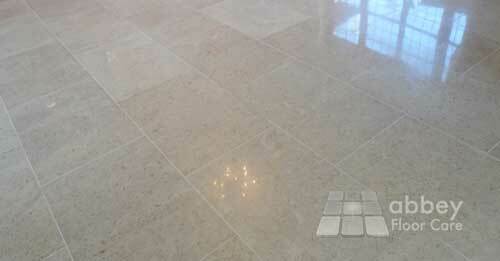 Limestone is a beautiful flooring and comes in a variety of colours and finishes. This floor was a grey limestone that had been laid a number of years ago. Over the years the floor had gradually lost its original finish and there were a number of issues that the homeowner was concerned about. 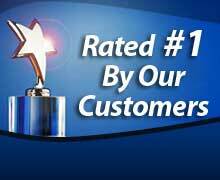 • the customer was also looking for an improvement in the appearance of the floor. 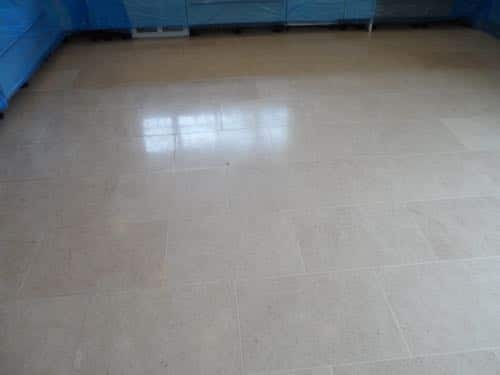 We suggested the customer have the floor ground smooth, then honed and polished to give it a completely new smooth honed finish that would be extremely easy to keep clean and significantly improve the appearance of the floor. We described the change in finish as going from a poor standard definition appearance to a high quality high definition appearance. 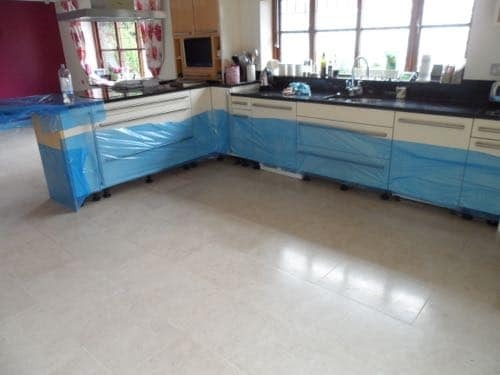 On the first day we started by installing our protection to the adjoining walls, kitchen furniture and floors. We need to install protective film because uneven tiles can cause splits as the machine first rides over the uneven surface. This protective film protects the surfaces from any splashes caused by the restoration. As a “light tack” product it will not damage wallpaper, paint or kitchen unit finishes. We were now ready for grinding using metal bond diamonds on our heavy duty planetary grinding machine. This process removed all the lippage from the floor, revealing a totally new smooth surface. This image shows the floor part way through grinding, the floor is still uneven. The grinding leaves a rough “open” surface and the next step is to “close” the stone and make the surface smooth. This is called honing. On day two we used the same machine to hone the floor using 50 grit, 100 grit, 200 grit, 400 grit to an 800 grit resin bond diamond disks. The floor was then lightly polished with polishing powder. The floor was left to dry and we applied two coats of impregnating sealer to the whole floor to help protect it against spots and spills. To finish off we filled areas of lost grout with epoxy grout. 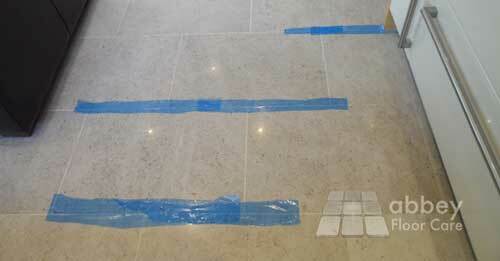 This grout is extremely tough and hard wearing, so it will stay in place for the life of the floor. It can can take a couple of days to fully cure, so we covered it with light tack protective film to prevent uncured epoxy being spread across the floor. As you can see the floor now looks polished and beautiful. Sometimes simple Limestone cleaning and sealing can turn into Limestone Grinding work, especially if the old sealer was applied over a rough, dirty surface. 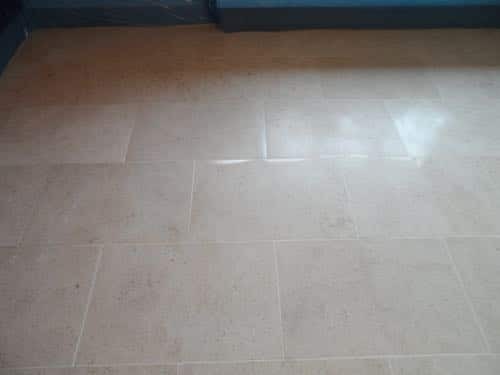 If you haver a limestone floor that you would like to restore to a new beautiful finish, please call 0800 695 0180, or click here, for your free or charge quotation. 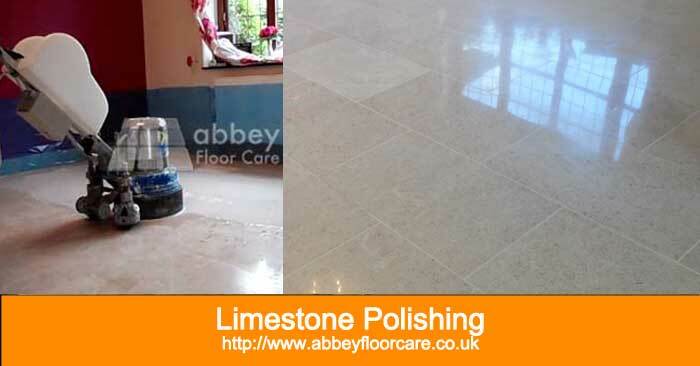 Do You Want A Beautiful Polish On Your Limestone Floor?